Hello. Thank you for updating! ^^ Working perfect. PS what about future update for Windows 10 Creators Update ? Are you ready ? No. Here's a hint for everyone, this isn't app-specific issue. It can be reproduced in any modern app, simply activate Tablet mode. A note about SeDebugPrivilege, it seems it's enabled by default when running under SYSTEM account. Yeah thats kinda what I figured. This was just an example. For me, this is a showstopping issue. Xbox is a big app for me and I cant use Aero Glass if I cant even resize windows properly. I mentioned this at least a month ago and there was no response it whatsoever, so if y'all could help draw attention to this, that would be great. BigMuscle needs to know its an issue so it can be fixed. Right now its just being passed over. BigMuscle needs to know its an issue so it can be fixed. Right now its just being passed over. Agreed. This feature for restoring modern app frames to have theme defined appearance has been considered experimental for quite a while and it seems it's not quite there yet. I think that detail about tablet mode is important to know for testing purposes, otherwise one could suggest just running Edge, since it's one of the apps that don't require Microsoft account, but guess what, it doesn't have full-screen toggle AFAIK. Don't forget you can just turn that particular Aero Glass feature off (http://www.msfn.org/board/topic/176569-aero-glass-for-win81-153/?do=reportComment&comment=1136963), so at least the functionality isn't effected in negative way. There is also a minor bug with caption centering feature, when application resizes its own window and TextGlowMode is set to 0 or 3, the caption isn't always centered right afterwards. 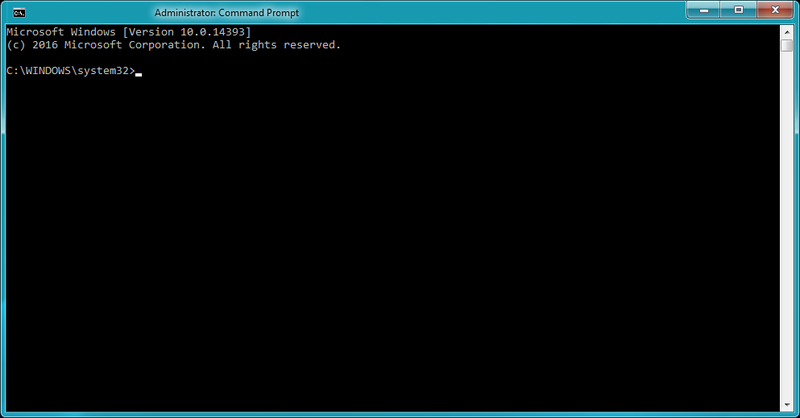 The easiest way to reproduce the bug is with Command Prompt window. Right-click on its frame, go to Properties->Layout then change Width under Window Size to something smaller than default eg. 80 and confirm the new setting. Then return to Properties dialog and set it back to 120. I installed the Creators Update and got the incompatibility message (ver. 1703.15063.0). Do we just need the symbols or will more work be needed for aeroglass? Chances are that you'll be without Aero Glass effects for a little while (weeks or months), since major OS releases usually change the system enough that the undocumented interfaces Big Muscle uses change in ways he hasn't anticipated. Big Muscle doesn't like to be asked about support for unreleased systems. The problem was that AeroGlass Causing the buttons to move to the left side and covering the "Go Back Arrow". 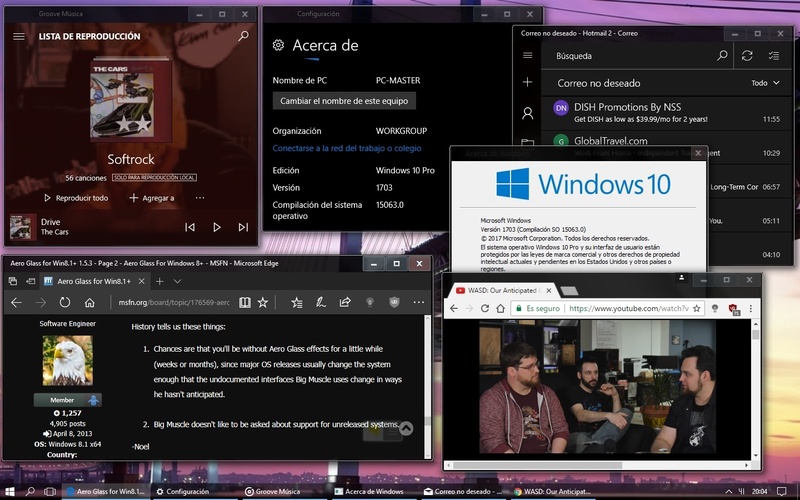 and it's still exist with no option (that i know about) to disable it on the modern Window only! I just installed a update "March 22, 2017—KB4016635 (OS Build 14393.970)" and AeroGlass is still working good. Also thanks for the 1.5.3 update. 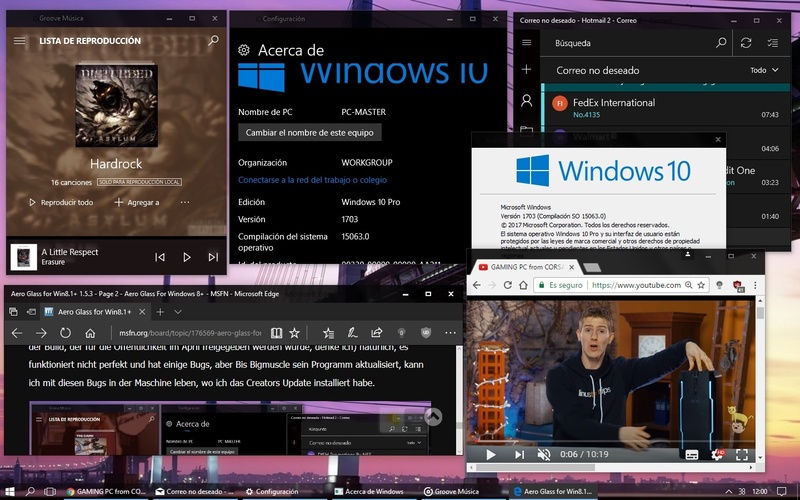 In fact, the themes, reflection and transparency effect work just fine in build 15063 (which is the build that would be released to the general public in April, I think) of course, it doesn't work perfect and has some bugs, but until Bigmuscle updates his program, I can live with those bugs in the machine where I have installed the Creators Update. I haven't been able to get aeroglass to work at all with the Creators Update. Did you do anything special to get the effect because it doesn't show up at all and if you move a window around it just splatters the window all over the screen. Update: Actually I got it working a little by pointing my theme to rounded corners in the AeroGlassGUI--all I get is some color to the title bar in the active window but no transparency and I get nothing in the inactive window. The splattering is gone with version 1.5.1 but was there with 1.5.3. Quick question for those of you that have the Creators update. Did you just install the update or did you uninstall Aero Glass first? Not only your problem not resolved; bug I mentioned in this post also not fixed yet (even not observed by @bigmuscle !). As for me, it should be more important than "glow effect" and other "bells and whistles" 'cause it's directly affected to the OS functionality. In der Tat, die Themen, Reflexion und Transparenz Wirkung funktionieren gut in Build 15063 (das ist der Build, der für die Öffentlichkeit im April freigegeben werden würde, denke ich) natürlich, es funktioniert nicht perfekt und hat einige Bugs, aber Bis Bigmuscle sein Programm aktualisiert, kann ich mit diesen Bugs in der Maschine leben, wo ich das Creators Update installiert habe. Your Pictures have not transparents !! I'm not sure but I think you misunderstood me because of the translator you use, when I said transparencies, obviously I was referring ONLY TO TITLE BARS and not to the rest of the window, that is what Aeroglass does, modify the appearance of TITLE BARS ONLY, if you want transparencies across the whole window you have to install other types of programs, personally I don't like transparency in the whole window, it looks horrible and it is not practical for everyday use, but it is my opinion, I guess others will like it. Best to uninstall first or at least make sure the task is not running. You may have problems if the task is running when you update--I did going from th2 to rs1 and was able to resolve the problem by turning off the task. Will it be any update for RS2?